CIS-A2K had planned a day long Telugu Wikipedia training workshop in collaboration with Telugu Wikipedians at the English and Foreign Languages University (EFLU), Hyderabad on March 8, 2013. The intention was to target research students at EFLU who are using Telugu material or working on topics related to Telugu and Andhra Pradesh. This event was also to be part of the Wiki Women’s month events across India. However, this event had to be cancelled in the last minute as a Research Student of EFLU committed suicide on the campus and there was major unrest. The faculty from EFLU though had informed of the possible cancellation of the event earlier, had only confirmed it on March 7, 2013. Rahmanuddin Shaik (Telugu SIG, Wikimedia India Chapter) and Dr. Rajasekhar (Telugu Wikipedia Administrator) had already blocked an entire day for this training workshop. In fact a lot of background work was already done for the EFLU event. When I got the news of cancellation of the workshop, initially I was very dejected at the thought of informing the two active Telugu Wikipedians about it, which I had to do. As my tickets were anyhow booked to Hyderabad and there was no point cancelling them, as I was already on my way to catch the flight, I decided to go ahead with my journey. I made some couple of quick calls and with some effort managed to organize a Wikipedia Training Workshop in collaboration with the Theatre Outreach Unit (TOU), University of Hyderabad (UoH). I was anyhow planning on visiting them to explore an institutional collaboration. The Project Director of TOU Dr. Peddi Ramarao, though agreed to spread the word about the workshop, yet was not sure how many would turn up at such a short notice of one night. So on March 8, 2013 Rahmanuddin, Dr. Rajasekhar and I landed at the Golden Threshold hoping against hope to see at least 3 or 4 participants. But alas there were only 2 people when we reached the venue by 10 a.m.. By 10.25 a.m. we had 9 participants, which excited us all. The training workshop began with an introduction of all the participants. Following this a presentation was made on the significance of Wikipedia in the digital era and how Indian language-Wikipedias are pivotal in preserving the vernacular language and culture. This session was interactive with participants asking many questions. Dr. Peddi Ramarao, later, spoke about his experience of using Wikipedia as a reference tool and how he got introduced to contributing Wikipedia. Further, the discussion went on to the poor quality of articles on Telugu Wikipedia and how the participants can take part in improving the existing articles and contribute new articles. Rahmanuddin and Rajasekhar practically demonstrated the process of editing on Telugu Wikipedia. This was followed by a hands-on session where the participants actively participated in creating their Wikipedia User name on Telugu Wikipedia and did editing of few articles. The training programme was to officially end at Lunch time but even post lunch some of the participants were enthusiastic about learning more nuances of contributing on Telugu Wikipedia. The hands-on session thus continued until 4 p.m.
Post the Wikipedia training programme, I have had interactions with the Project Director of TOU to explore possible future collaborations. TOU, UoH agreed to offer space to host all Telugu Wikipedia meet-ups. As the Golden Threshold space was in the central part of the city, having this infrastructure accessible was a major boost for the Telugu Wikipedia community in Hyderabad. Further, in the discussions we have agreed to collaborate with TOU, UoH in hosting the first mega Telugu Wikipedia community event Telugu Wiki Mahotsavam 2013. Out of the 9 new Users, who were trained during this workshop, 5 people have done more than 5 edits. 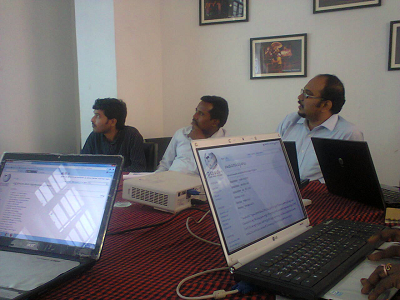 Because of CIS-A2K’s efforts, Telugu Wikipedians in Hyderabad now have a good meeting space. The availability of this space has also encouraged the Telugu Wikipedians to meet more often than before. 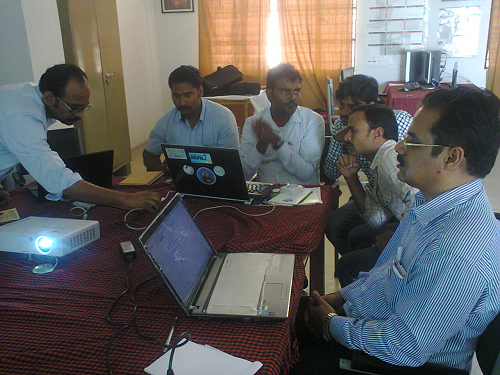 Since March 8, 2013 Telugu Wikipedians had a total of 6 meet-ups, and all these were held at Golden Threshold. Golden Threshold also became a venue for hosting Telugu Wiki Mahotsavam 2013. This visit to Hyderabad triggered a discussion about organizing Telugu Wiki Mahotsavam, which was successfully organized in a month’s time. Looking back, though this event was done as a last minute measure without many expectations, yet it turned out to be a lucky break! Especially, because this was my first ever event as the CIS-A2K Programme Director. It will remain a very memorable one. More so because it was done in collaboration with two of the active Telugu Wikipedians. Even more so because it has created some positive energy for the Telugu Wikipedia community, which has since then become a home turf.